Alex dreams of becoming a night worker just like his dad. One night before bedtime, Alex is surprised when his dad hands him a hard hat. Now Alex can see what it is really like to be a night worker! 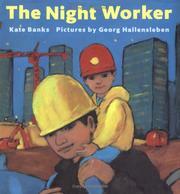 Banks, Kate, “The night worker,” Children's Picture Book Database at Miami University, accessed April 20, 2019, https://dlp.lib.miamioh.edu/picturebook/items/show/7525.